Powered by NextGen Gaming, A Dragon’s Story turns fairytales as we know them on their head, reason being, instead of fighting to defeat the Ruff (the dragon), it is your job to protect his den. Filled with valuable gold, you’ll be expected to guard his lair from Sir William’s thieving hands. But don’t worry, your favour won’t go unnoticed. Defend Ruff’s cave and you’ll be rewarded charitably. What’s more, if you land a triumphant spin you’ll get to delight in watching the unbearable Sir William on fire! Not only is the extremely amusing, but it also comes with great rewards as the knight is likely to drop his robbed riches while you sit back and watch. NextGen Gaming set the bar high when it comes to slots online. With an impressive 15 years’ experience, you can expect reels of the highest standard coupled with unique features. All their games offer a blend of features from Free Spins, to bonus symbols and SCATTERS, making them all the more distinct. They create games with their audience in mind – and by that we mean branching out to the ever-growing mobile market. Yes, all of their latest releases are now available on smart phones and tablets, so players can gamble on the go if they wish. With a mountainous backdrop and relevant music, the game begins how we would imagine it to, in Ruff’s den. The symbols in the game also fit the game’s Medieval timeframe with items like shields alongside letters and numbers. The WILD symbol in this game comes in the form of the red dragon and substitutes for every other symbol except for the SCATTER. The SCATTER symbol is the pink jewel, and 3 or more of these will result in 10 Free Spins. Little Dragons adds greater depth to the game. That’s right, this little extra sees these small mythical creatures igniting symbols with their scorching fiery breathe. When this occurs, this will increase your chances of your winning. If you want to release more little dragons, this is also possible through the Superbet feature. Meanwhile, this game’s best feature has to be the Brave Sir William bonus. After all, there’s nothing more satisfying than throwing a fireball at the obnoxious knight, and if he drops his winnings, you can steal them. Feeling extra lucky? Then you can always gamble your winnings by guessing a card’s colour or suit. The correct colour will double your total and the correct suit will quadruple your amount. Get it right and you could take away an impressive sum of money– are you up for the challenge? 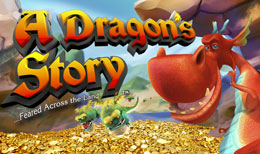 Whether it’s vibrant colours that attract you online slots or the number of bonus features, whatever it may be, Dragon’s Story ticks all the boxes. However, if you want to make the game a little more exciting, we suggest you use the Superbet option. This will make the game all the more exciting while adding something a little extra to the gameplay.